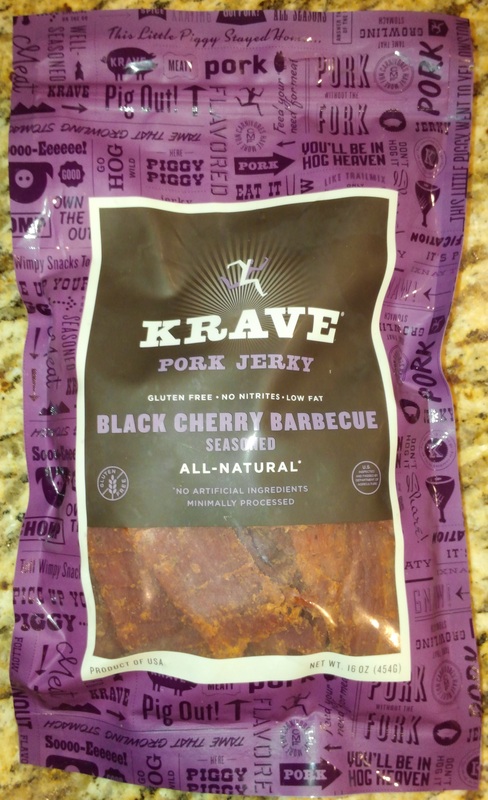 Today’s tasty testing is being conducted on a big ol’ bag of Krave Black Cherry Barbecue Pork Jerky procured at the local Costco. Taste (A): From your first bite you taste delicious pork that starts with a mild, almost timid sweetness. There’s sugar, honey, and molasses in there but it takes a little time for them to be distinct. The cherry flavor comes next, riding the wave of the sweets. It’s a carefully balanced fruitiness that adds to the taste all on its own. The savory flavors that follow, a bit of red wine and the garlic and onion, quickly capture your attention without detracting from that delightful fruity sweetness. There’s a bit of a spiciness that tops it all off, after a spell, culminating in a terrifically complex yet subtle taste that’s nothing less than masterful. Still, in every bite, you taste that delicious lean pork, its flavor elevated through this impressive display of skill and execution. Texture (A): This pork is exceptionally tender, cut along the grain, and tears easily in strips. It is particularly easy to bite and chew and has a substantial feel to it. It provides a really enjoyable bit of eating. 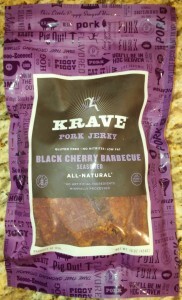 Smell (B+): You can detect a good bit of the flavors of this jerky in its scent. The garlic and onion are prominent along with that red wine and black cherry. It’s very appetizing and easily preps you to take that first bite. Appearance (A): This jerky looks great. The generally large strips of pork are natural cut and sliced moderately thin. The meat itself is lean and sports a rich reddish-brown color overall with lightly colored edges here and there. The larger pieces are accompanied by a variety of smaller jerky bits – thin strips, tiny nuggets, etc. – adding to the artisan feel of the meat. Consistency (B+): The cuts of meat exhibit a good bit of variety in size and shape, though most are larger strips. Every piece in the bag is sliced to a uniform thickness throughout, even the tiny bits, and the moisture content is just perfect down the last bite. The flavor is almost as consistent. The overall flavor throughout the bag was really, really good, but the balance of flavors did vary somewhat from piece to piece. In some pieces the sweetness and the black cherry flavors seemed notably more pronounced while in others they were more subdued relative to the spicy and savory flavors present. While the aggregate intensity seemed to be pretty much the same this variation was notable. To be clear, it didn’t detract from the jerky in any meaningful way but it didn’t seem intentional, either. It’s a minor blemish in an otherwise masterfully made meat. Overall Impression (A): Its always great to find a unique jerky flavor that delivers on the prommise of being something special, and this jerky is definitely something special. The novelty of the black cherry flavor alone would make this a noteworthy treat, but made with such a delicately balanced flavor while honoring and preserving the innately delicious pork itself… wow! Nicely done, Krave! If you have the opportunity you should definitely pick up some of this exceptional pork jerky. Great snacking awaits you… eat well! Tagged artisan, gourmet, Krave, pork, sweet. Bookmark the permalink.